In Marxist theory (from where the terms socialism and communism definitively originate), we essentially have the following idea and sets of definitions. A society consists of people, and people consist of things called property (with the second consist in the sense of ownership). Communism refers to a society in which society itself owns all of the property; that is, in a communist society, each individual owns all of the property. Note that this is equivalent to definition 2a in  for if there is no private property, then for every property, there is no person who does not own it (otherwise it would have been private). And conversely, if everyone owns everything, then there is no property such that some person doesn’t own it (i.e. there is no private property). It follows that we define a representative government to be communist if and only if it is a government of a communist society. This way if we think of the government as a subset of society, then if members of the government own all of the property (i.e. communist government) and the government is a representative government, then all of the members own all of the property via the representation. And conversely (and trivially) if the society is communist, then all members, and hence also those in the government, own all of the property. In reality, no society or government is truly communist; one can always find something not owned by all members of the government or society. For example, one could argue that any individual owns their thoughts, and no other individual owns the thoughts of So this would be one trivial counter example. A capital society is defined as a society that is not a communist society. That is, in a capital society, it is not the case that every member owns all property. Ownership in a society may certainly change over time. If it is heading in the direction of communism, we say the society is socialist. If it is heading away from communism, then we say the society is capitalist. If it is neither heading toward or away from communism, then we will call it static. The claim that we are all socialist boils down to the fact that there is much consensus on the desire of public services including police, fire, medical, and education. We pay taxes for these entities that serve us as needed. In this sense, we all own them. And we always want to see them improved. For these things to exist, we need a government to oversee them. Continually wanting to see them improved translates to us wanting a say in how governmental money is distributed to them. Since this money comes from other members of society (as taxation for example), this amounts to us wanting more ownership over what was formerly some other person’s property. It is this sense in which we are all socialist. Just take a look at the chart previously posted. 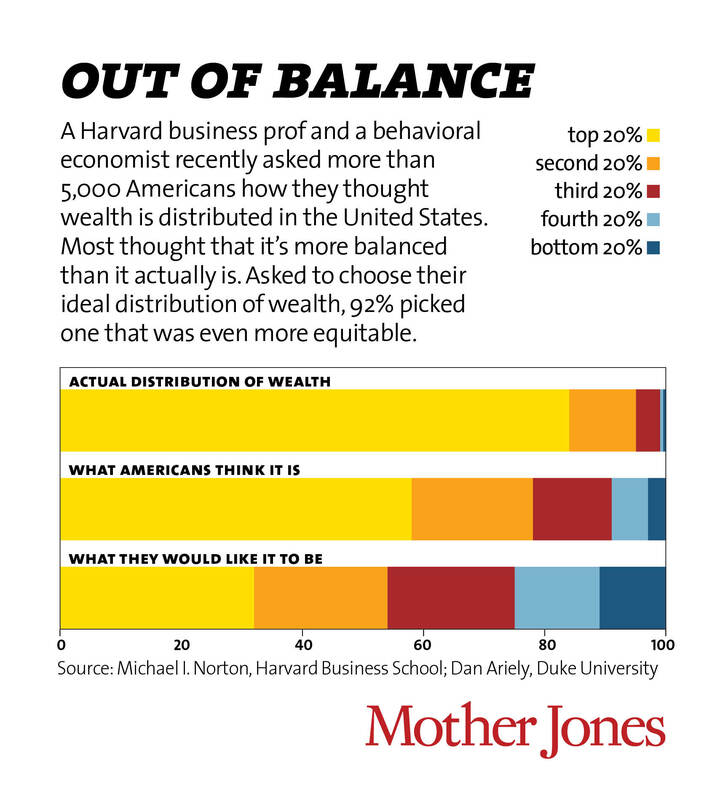 It shows that relative to where we are now (the actual distribution of wealth), we want the wealth to be different (what we would like it to be). We want more ownership over how resources are distributed in society. Also consider provisions in the Affordable Care Act once stripped from its colloquial term “Obamacare”, which has lately had much negative connotation. These polls suggest that most Americans support having more control/ownership of insurance companies in the sense of declaring how they can and cannot operate , . The actual paper can be found here. With the termination of the military’s “Don’t Ask Don’t Tell” policy as of yesterday, I am reminded of the fundamental concept at play that delayed this resolution for so long. This fundamental concept is also at the core of many other issues: gender discrimination, racial discrimination, religious discrimination,…, X discrimination. This fundamental concept is at the heart of contemporary political partisan bickering, the wealth gap, and wars altogether. This fundamental concept is the scarcity of resources. When the set of resources available to a population in insufficient for that population, members of the population will inevitably compete for them. The ingroup bias has become the catalyst for nonuniform distribution of resources. The ingroup bias follows from the ingroup instigation. The heuristic for obtaining resources is cooperative gameplay. We primitively wish to form alliances with people for the sole purpose of overpowering others (or groups of others) in order to ensure the acquisition of resources. This is the biologically intrinsic (and evolutionally reinforced) tendency which I call the ingroup instigation. Given the objective of the ingroup (to work together), the ingroup bias (the tendency to favor individuals in the ingroup and disfavor those in the outgroup) follows. If we assume this to be true, then the function determining which individuals will group is only governed by what best allows them to overpower other groups or individuals. By default this starts with proximity and special cases of it such as family (note also how fundamental physical forces operate). Then, once some groups gather many resources, it may be beneficial for them to team as well. This can be seen in political alliances, corporate mergers, residential segregation with respect to socioeconomic status (i.e. poor towns or rich towns),…,collisions of galaxies, etc. It then follows that any minority or group of individuals who have less power become targets of the majority, simply because it is easy to take their resources. Whether it be a minority based on gender, race, sexual orientation, or religion, the characteristic of a group being a minority–not being in the ingroup of those with the quantitative or qualitative power–becomes sufficient for hindering their progress and in turn targeting their resources. Hopefully one day we will realize that “potential knowledge” is a good with no scarcity that can in turn be distributed to everyone without limits. The amount of knowledge in a system will always be finite (but not constant), yet it will also always be an upper bound on usable resources in society (i.e. the amount of consumable resources in the system is dependent upon the amount of knowledge [on how to create such resources from raw resources] in the system at that time).